I wanted a scalable version of this poster: so I offered 1BTC on the bitcoin forum and someone produced a version I can print and put on my wall in my home office. Here is the SVG. Enjoy!. The SVG has a typo — “photohraphs”. Is that poster on the left for real? Yes, the number of times I’ve been stopped by police because I’ve been talking on a hand-held radio. 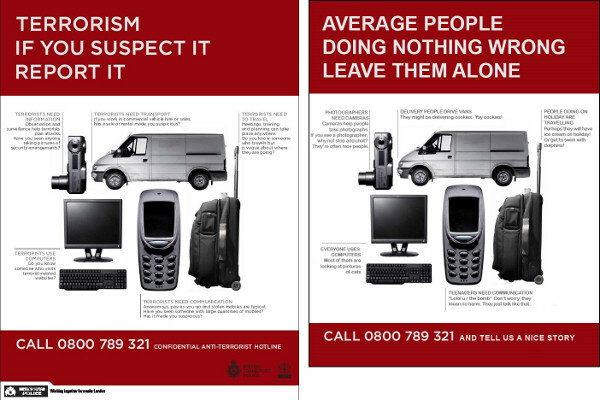 That, and a mate of mine once had a camera confiscated by the London City Police for an act of “suspected terrorism”. Simple matter is, it’s not what they do, it’s the intent of their actions. Stop people doing what they do, and the terrorists have won.